LIBERTY, NY (August 14, 2014) – The Liberty Museum & Arts Center has announced the schedule for their 13th annual Catskills Preservation and History Conference, to be held at the Museum on Sunday, August 24. The full day event includes a driving and walking tour in the morning, and programs and panel discussions throughout the day, culminating in the presentation of the Second Annual Catskills Preservation Award and the opening reception for the “Pollack’s Hotel Exhibit” at 7:00 p.m.
Pollack’s Hotel was a small family owned resort in Liberty, and Marion Windt, one of the last of the family to operate the resort, and a member of the Museum’s Board of Directors, will be on hand for the reception. Speakers at this year’s conference include Barry Lewis, the Executive Editor of the Times Herald-Record newspaper, who writes and speaks frequently about his experiences as a summer employee at several hotels, Dr. Irwin Richman, Professor Emeritus of American Studies and History at Penn State University-Harrisburg and author of 25 books, including “Borscht Belt Bungalows: Memories of Catskill Summers,” Sullivan County Historian John Conway, planner and County Legislator Alan Sorensen, architect and author Ross Padluck, whose 2013 book, “Catskill Resorts: Lost Architecture of Paradise” has added a wealth of information to the body of work about the Sullivan County resort industry, and architects Victor and Robert Dadras, who will discuss the concept of repurposing vintage Sullivan County resorts as modern day boutique hotels. The conference also features two panel discussions, including one with former hotel owners. The conference begins with registration and a light breakfast at 8:00 a.m., followed by a driving and walking tour at 9:00 a.m. The first program begins at 11:00 a.m. A full schedule of events follows. The fee for the conference is $25.00 per person, including the light breakfast, lunch, and the reception. =The fee for the driving/walking tour is $20.00 or both events can be attended for $35.00. There is no charge to members of the Liberty Museum & Arts Center. The Liberty Museum & Arts Center is located at 46 South Main Street n Liberty. For further information, contact the Museum by phone at 845-292-2394 or by e-mail at lmacinfo@libertymuseum.com. 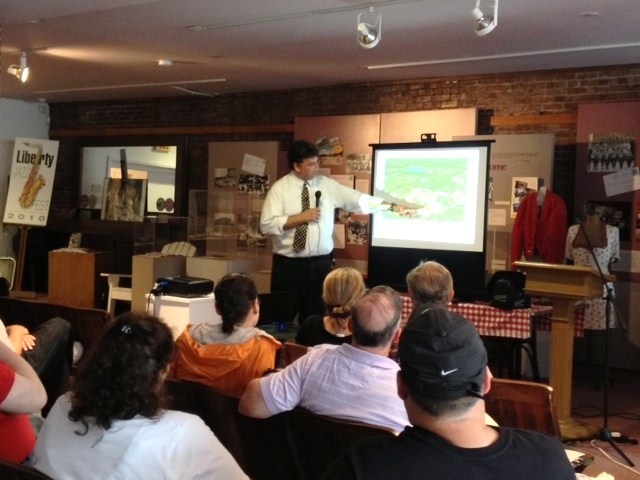 In the photo above: Robert Dadras presents at the 2013 Preservation and History Conference at the Liberty Museum & Arts Center. His topic this year: Re-purposing old Catskill Resorts. "500 Hotels! Tourism in the Sullivan County Catskills: Past, Present and Future." "Hotels and Bungalows: Ambivalence, Love and Hate."